Jobs in Canada for International Graduates. If you have recently graduated from university, you may be thinking of relocating to Canada. Although the jobs in Canada for international graduates are very competitive, there are a number of excellent graduate opportunities for overseas candidates depending on which field you have qualified in. Here we look at some of the best fields for international graduates to find employment in Canada and the best ways to find jobs in these industries. If you have recently obtained a law degree, your skills are likely to be in demand in Canada; however you will have to take some steps in order to be permitted to practice in the country. Overseas law graduates will have to take the NCA assessment tests through the Federation of Law Societies of Canada. There may be several different tests to undergo depending on the results and qualifications that you have obtained and any prior legal experience that you have, however most graduates will have to take around five different exams. Those who are successful in passing these exams will have plenty of opportunities to work within the legal field. Some possibilities include working for Law in the Public Interest including legal aid work, private practice for individual clients within a specific field such as corporate, environmental or employment law or working for the government in a legal capacity such as a Crown Attorney. It is also possible to use a law degree to become a mediator to try to settle disputes before going to court. The engineering field in Canada is a shortage skills area and overseas graduates will be warmly welcomed to the country. The Canadian engineering profession is highly regulated and you will not be permitted to practice or call yourself an engineer without obtaining the appropriate license from your province or territorial association. There are territorial and provincial regulatory bodies which set the standards for all engineers on entering the professional and for giving licenses to those who meet the relevant criteria including experience and qualifications. You will therefore need to contact the regulatory body for the area in which you will be living to obtain the appropriate license. Graduates with a degree in accounting or finance are welcome to come to Canada to work in the industry as a certified general accountant; however they must first complete 4 PACE (Professional Applications and Competence Evaluations) modules which are offered by the certification body, CGA-Canada. This training can be done while undergoing the 3 years of professional experience that is necessary in order to become certified. Those who are graduates in finance or business are eligible to become chartered accountants in Canada; however they must have 3 years of professional experience before becoming certified. Alternatively it is possible to become a certified management accountant if you have a business or finance degree by taking a two day examination to assess your skills in accounting and business management. This will then give you access to the necessary 2 year training program which will combine experience in the field with mentoring and case studies. If you have a degree level qualification and excellent English communication skills, you have the possibility of coming to Canada as a teacher of English as a second language. While there is lower demand for this type of graduate, French speaking areas are often looking for English language teachers although practical previous teaching experience and perhaps a TEFL certificate would be an advantage. The TESL Canada Federation is a helpful resource to assist graduates in finding work in this field. It is advisable to apply for graduate positions in Canada before relocating to the country. The best way to apply for any Canadian graduate job is to send a CV and cover letter to the employer including all the standard details about you like you previous employment experience, personal details and qualifications. You should keep your CV quite brief, and no longer than 2 pages. Although you do not have to put down any references on your CV, if you are interviewed, you must be prepared to provide them. You may need academic, work-related and personal references. Always target your application letter to each individual employer to make sure each application sounds relevant. If you are still overseas when you are offered an interview, you may be interviewed either by telephone or via Skype. You should always research the employer fully before your interview and prepare yourself by thinking ahead about which questions may be asked. While Canadian employers recognize most international qualifications, you should always check with an employer as well as the Canadian professional body for your industry before making an application for a job. Some regulated professions will demand that your qualifications are assessed before you are offered a position. 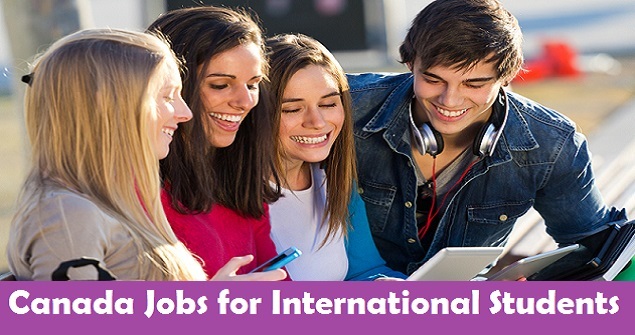 There are many job websites on which you can find vacancies for international graduates including Canadajobs the Canadian Job Bank website and Workpolis. There are also several employment and recruitment agencies which are reputable and which can find you suitable work in the country. Canadian newspapers will also list graduate opportunities. Another possibility is to simply send your resume and cover letter to companies that you are interested in working for as speculative applications are often sent out in Canada. There are several international companies which offer internships at their Canadian offices, so you could also check the websites of any firms that you have an interest in working for to see if they can offer you a suitable opportunity. There are also some organizations which offer internships to international graduates in Canada including Go Abroad and Latitude Travel.